"Tsiell Waututh. Musqueam. Tsawwassen. Kwayhquitlam. Semiahmoo….That is how it all began for Vancouver”, Tom Ryan, the guide, sputtered, a hint of his tidy crow’s feet peeping impishly from behind the black-rimmed spectacles. “Kwayhquitlam?” The name flummoxed me. I thought Ryan had begun a tongue-twisting lesson in the world’s most livable city, Canada’s most walkable city and one of the world’s top 10 ultimate sports cities. “And this is Ayyulshun”. Before I could roll the ws in Tsawwassen and ts in Waututh, Ryan threw in another brainteaser as raindrops smacked the city and robins warbled by a gigantic red cedar. “Beginning of Vancouver ?” I had to chivvy Ryan for the real story. Rainy day or not, always trust the guide, they tell you the real stories. Even Ryan did. 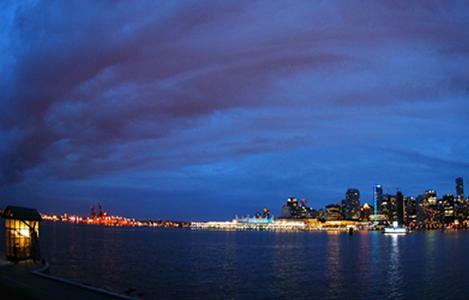 Vancouver’s beginnings can be traced back to 16,000 BC when the ancestors of the Coast Sallish tribes with knotty names arrived from Asia; they called English Bay Ayyulshun and loved the silvery salmon that clutter the rivers in British Columbia. That is how it all began for Vancouver. If Vancouver began with unusual tribe names, I stepped into the city in an unusual fashion. I chugged into the city. Literally. I hopped into the Rocky Mountaineer train for a 3.5-hour journey between Whistler and Vancouver, host cities of the 2010 Olympic and Paralympic Winter Games. Called Sea to Sky Climb route, the train hisses and toots along the historical Pacific Great Eastern rail line that connected Vancouver with Prince George and was wittily called the line “from nowhere to nowhere”. Now, the “nowhere to nowhere” tag seems pure baloney, everywhere is somewhere beautiful. As I stood in the open car, the nippy breeze cut through my red poncho and the train whistled past thundering waterfalls, trestle bridges, the tall Mount Garibaldi, glacier-polished granite monolith, Brackendale (home to 3,000 bald eagles), Howe Sound fjord, Porteau Cove, famous for its sunken ship and rubber-tyre reef… That was not all, though. On the 73.7-mile journey, a tubby attendant named Elizabeth deconstructed the “DNA of an award-winning train”, served dainty scones and tarts sinfully laden with cream, poured orange pekoe tea out of impeccable white china snouts and funnily called Queen Elizabeth “the other Elizabeth ”. Forgive the funny bone. Even without it the journey lives up to its reputation as one of the world’s most scenic rail routes. In rainy Vancouver , the orange pekoe, perhaps, is not enough to stir the soul. I wanted Robert Burns on the table. And I knew where to find him. In the old-world Irish Heather Gastropub. No, the Scottish poet was not in his breeches and cloak quaffing ale at Irish Heather, he is now a famous cocktail made of whisky, absinth, vermouth and orange bitters. He, however, was not the only one that I bumped into in the famed whisky-tasting gastropub. On the rather simple yet ‘spirited’ menu there was Sidecar, a cognac concoction created in Paris during World War 1; the infamous Irish Coffee that Chef Joseph Sheridan served to shivering sea-soaked travellers in the late 1940s, Old Fashioned (bourbon + sugar + bitters drink), the first drink to be (disputably) called a cocktail and 207 other whiskies. But I was hungry and that rainy night in Vancouver , I was just not chuffed by pub grub, I needed to eat. I moseyed up the Blood Alley and into the trendy Salt restaurant that has its food honours etched on the glass wall. I was getting prepped for the traditional bannock when Monica Leeck of Tourism British Columbia pulled the plugs off my hunger. “The restaurant has no kitchen. All they have is a slicer,” she chirped casually. I plonked on the steel stool and felt like Oliver Twist ready to graze grass. Yes, grass. What more could I get with a slicer! I brooded. But, boy, I could not have been more wrong. From the chalkboard menu, I could build a charcuterie tasting plate from 10 cheeses, 10 meats and 10 condiments and pair with the finest wine. The cold cuts and peppy music not only warmed the night up, the red slicer also altered my definition of culinary delight. Good food need not be cooked, you could merely slice it! “Bundle up warmly. We’d go up the Grouse Mountain, walk in snow, see the grizzly bears and then be beamed up to Eye of the Wind, the wind turbine”. The next morning began with Ryan’s instructions. I looked at my tan shoe with tapering heel and my grey leggings and flinched at the thought of doing the Grouse Grind, the 2.9 km trail which the Vancouverites call the Mother Nature’s Stairmaster. The thought of hiking up a hill made me huff - I’d rather be a frozen sorbet in snow. But, please, no hiking. I beseeched. Thank god, there was the red Skyride to the top of the mountain where the grizzly bears were lazing on a sheet of snow and burly skiers with large glasses and oversized snow boots were hurtling down the mountain. My task was easier. I stepped into the elevator of the 65-metre tall wind turbine – the world’s first wind turbine with an elevator (the turbine generators were made in India ) and a glass-bubble 360-degree view of the city. From the top of Grouse Mountain, Vancouver looks like a deft artist’s most exquisite painting – squiggly green of the red cedar and Douglas fir, the hurried turquoise strokes of the river cutting through the city’s midriff, blobs of the mountain browns, lazy splashes of silvery snow interspersed with skyscrapers frantically reaching out to the skies, red slanted roofs adding the zing and Chevron’s floating petrol station in Coal Harbour toting up an eerie intrigue. Vancouver was shimmering in the afternoon sun and I thought I had seen the entire city that borrows its name from a Dutch captain called George Vancouver. Unfortunately, Gassy Jack was tight-lipped. He had no stories. Ryan had several. As the car swerved through the lush greens of Stanley Park , he began, “Look at that yellow mound by the harbour. That is powdered scrambled egg from McDonald’s (it was sulphur). The trees in Vancouver were so tall and wide that they could double as a dancefloor. The first meeting of Vancouver City Council got delayed because no one remembered to bring pen and paper. An errand boy ran to the local stationery store for supplies. Chester S Rollston, a Vancouverite, invented the modern clothesline….” Ryan was pulling rabbits out of his Vancouver storybook, a hint of his tidy crow’s feet peeping impishly from behind the black-rimmed spectacles. I tucked the favourite sulphur/scrambled egg story into my black bag and returned home. It has been days but the story still makes me laugh.